Patients with a life-threatening illness can be confronted with various types of loneliness, one of which is existential loneliness (EL). Since the experience of EL is extremely disruptive, the issue of EL is relevant for the practice of end-of-life care. Still, the literature on EL has generated little discussion and empirical substantiation and has never been systematically reviewed. In order to systematically review the literature, we (1) identified the existential loneliness literature; (2) established an organising framework for the review; (3) conducted a conceptual analysis of existential loneliness; and (4) discussed its relevance for end-of-life care. We found that the EL concept is profoundly unclear. Distinguishing between three dimensions of EL—as a condition, as an experience, and as a process of inner growth—leads to some conceptual clarification. Analysis of these dimensions on the basis of their respective key notions—everpresent, feeling, defence; death, awareness, difficult communication; and inner growth, giving meaning, authenticity—further clarifies the concept. Although none of the key notions are unambiguous, they may function as a starting point for the development of care strategies on EL at the end of life. Health care research shows loneliness to be an emotion which often accompanies dying [e.g., 1, 2, 3, 4, 5, 6, 7]. Loneliness of dying refers to at least three different conditions. Firstly, it may refer to social loneliness, which is the feeling of sadness and longing that results from a lack of an engaging network [8, 9]. Social loneliness often occurs in dying due to a decline in health, a decreased network, loss of social roles, and loss of partner and family. Secondly, loneliness of dying may refer to emotional loneliness, which is the feeling of utter aloneness even in the presence of others and which results ultimately from a lack of an attachment figure [8, 9]. Emotional loneliness relates to dying as people may have great difficulties in understanding and expressing their emotions concerning their approaching death. Thirdly, loneliness of dying may refer to existential loneliness (EL). EL is understood as an intolerable emptiness, sadness, and longing, that results from the awareness of one’s fundamental separateness as a human being [10, 11]. EL is mostly experienced in life-threatening situations [12, 13] because it is in the confrontation with death that one is most aware of one’s own fundamental aloneness. This loneliness can be nullified neither by the presence of others nor by an adequate dealing with feelings—the isolation of having to die alone remains [e.g., 14, 15, p. 96]. EL is therefore claimed to be essential to the understanding of the loneliness of dying [e.g., 11, 12, 16]. Whereas social and emotional loneliness of dying are increasingly recognised as relevant topics for research [e.g., 4, 17], the EL that may result from the awareness of having to die alone has received limited attention . As a consequence, the theoretical framework for researching EL of dying remains limited. In order to contribute to such a framework, this study systematically reviews the Western psychological and medical literature on EL. By doing so, the issue of EL is explored in connection to contemporary medical practice. The review is limited in at least two ways. Firstly, the psychological and medical literature largely exclude spiritual understandings of EL—as may be present in, for example, Buddhist or classical Christian sources. This limitation may be due to the secularised nature of most psychological and medical research. Except for the inclusion and discussion of some modern Christian sources that address the issue of EL, spiritual understandings of EL are not elaborated upon in this review. Secondly, only few authors illuminate the relationship between EL and end-of-life care. An exploration of the relevance of EL for end-of-life care, therefore, largely goes beyond the literature now available. In order to explore the relevance of EL for end-of-life care in spite of this limitation, we structured the manuscript as an in-depth examination of the concept of EL and, from there, explicated its relevance for end-of-life-care. By doing so, this review provides a basis for the further application of the EL concept into guidelines for clinical assessment and intervention. To systematically review the literature on EL, Medline (98 hits), Embase (71 hits), PsycInfo (656 hits), and Web of Knowledge (99 hits) databases were searched for articles in English that were published until July 2008 (total 924 hits). The search terms used were ‘loneliness’, ‘solitude’, and ‘isolation’ in combination with ‘existential’ and ‘existentialism’. Further references were found in the literature obtained from the initial search. The inclusion criteria were that articles address the concept of EL, whether they do so in a scientific or popular style and in an extensive or more limited way. Studies that use the term EL without any explication [e.g., 18, 19, 20] or that describe loneliness as fundamental to human nature without naming it EL [e.g., 21, 22, 23, 24, 25, 26, 27, 28, 29] were excluded. Twenty-seven studies were found to be relevant for our review (Table 1). To explain that loneliness is an EL, and to strike a chord in the lonely life of others in order to reveal the terror and beauty of loneliness. Personal disclosure of loneliness through an implicit phenomenological analysis. Many patient stories are interpreted from a Freudian, neo-Freudian, literary, existential, and religious view. A selection of his own and his clinical patients’ lonely experiences. A moving account of the nature of loneliness in which EL is a condition of human life and an experience that enables the individual to sustain, extend, and deepen his humanity. To show the difference between neurotic loneliness and EL, and to argue that EL is a prerequisite for inner growth. Argumentation is based on an implicit neo-Freudian perspective and shored up by the author’s psychotherapeutic experiences. 2 short cases—one illustrating neurotic loneliness and one illustrating EL. An account of the therapeutic process in which one’s neurotic loneliness is altered into relatedness with others and with one’s EL in a way that leads to authentic creativity. To reveal how periods of EL can help a person move toward greater authenticity and more meaningful love relationships with fellow human beings. Personal disclosure of various dimensions of loneliness through discussions of topics such as encounter groups, the lonely child, and the relation between loneliness and love. A moving and sensitive description of various dimensions of the relationship between loneliness and personal growth. Loneliness is explicated as EL, but the adjective ‘existential’ is not used often. To test if secondary loneliness, in contrast to primary or existential loneliness, varies with the amount of cathectic investment of persons separated from their cathectic objects. Cross-sectional survey using data collected from focused interviews. EL functions as an implicit background for secondary loneliness. 133 hospitalized non-intensive care adult patients in two general, short-term urban medical centres. Cathetic investment (endowment of persons and objects with meaning and energy) is identified as a new concept for a theory of loneliness. EL is a force for conducting cathetic investment. To present a psychology of loneliness. The main division is between pathological loneliness and EL, which can be further divided into five other types of loneliness. Theoretical analysis based upon F. Fromm-Reichmann, H. Sullivan, and many other authors on loneliness, as well as various case examples from psychotherapy. Not applicable. However, many illustrative examples are used. A thoughtful and thorough analysis that shows how various types of loneliness may manifest themselves as EL (which is seen as normal loneliness) or as pathological loneliness. To understand the dynamic forms of loneliness in order to plan more optimal treatments. EL is presented as a psychodynamic form of loneliness. The development of loneliness is traced and its forms are classified. The concept of EL is implicitly based upon a Freudian and neo-Freudian perspective. Implications for treatment are discussed. Mourning is the normal reaction to a loss and involves loneliness only in case of a disturbance in dependency. EL results from the individuation process. It is brief and leads to more independence. To examine loneliness as a contemporary personal and social problem and from the perspective of the Scriptures. Analysis is based upon a selection of psychological, sociological, medical, and religious literature. A claim that EL results when man makes himself the center and source of his own life. Social and spiritual alienation separates us existentially. To uncover clues and evidence supportive of a constructive, immaterialist philosophy of consciousness in which man is existentially an absolutely lonely and isolated being. Philosophical analysis of loneliness is based upon (1) a rejection of materialistic interpretations of consciousness, and (2) a metaphysical and transcendental-phenomenological exploration of how loneliness appears in consciousness. Loneliness is the basic structure of consciousness and a transcendental condition for the possibility of companionship. As loneliness is considered to be EL, the adjective ‘existential’ is hardly used. To argue for existential psychotherapy. An explanatory paradigm of existential isolation is presented, permitting the clinician to formulate a strategy of existential psychotherapy. 4 ultimate concerns of life are explored: death, freedom, existential isolation, and meaninglessness. Existential isolation is explored from an atheistic existentialism and an existential-phenomenological approach to psychotherapy. A selection from his clinical experience as a psychiatrist. The clinician encounters interpersonal, intrapersonal, and existential isolation. The experiences of loneliness that results from these isolations may feel the same. Examples show that authentic relationships require awareness of existential isolation. To argue that EL is a gift that offers people the opportunity to recognize their incompleteness and an invitation to accept their part in the work of creation. Limited exposé based upon eclectic use of authors. Reference is made to both religious and non-religious authors. EL reveals that God lies at the heart of people’s loneliness—acceptance leads to paradise and refusal leads to one’s inferno. The term loneliness is mainly used without the adjective ‘existential’. To address theoretical matters of loneliness and to elaborate a model that can be applied to social research. EL is considered to be one part of loneliness. Exploration of classifications of loneliness and alienation. From there a model of estrangement-loneliness is derived. Loneliness consists of emotional and social estrangements. It is caused by the self and structural estrangements, and it leads to meaninglessness. Severe experiences of meaninglessness may result in EL. To show that we are existentially lonely, that solitude enhances social, psychic, and spiritual well-being, and that theologizing about loneliness gives meaning and brings realism to one’s faith. Portrayal of man’s lonely condition from a mainly experiential-philosophical perspective. Further explored by means of a biblical survey of loneliness as normative to the faith experience. Personal theology focuses on human experience in relation to God. The discovery of our lonely isolation and separateness in this world leads us inevitably to take a stand towards God—moving us toward unbelief or faith. To address the problem of loneliness and social support in mothers of chronically ill children. To test if loneliness is different according to whether a chronic illness is life-threatening or not. Quantitative interviews (revised UCLA Scale and the Norbeck Social Support Questionnaire). EL is implicitly approached from a secular existential psychodynamic perspective. 90 mothers—33 whose children suffered from a chronic life-threatening disease and 57 whose children suffered from a chronic illness. The control group consisted of 92 mothers of healthy children. Mothers of chronically ill children may experience intense loneliness. Only when the illness is not life-threatening may social support lessen loneliness. One explanation given for this finding is that the loneliness in mothers of children with a life-threatening illness is an EL. To examine how narratives of AIDS patients reveal emotional, social, and existential loneliness. To provide suggestions for how to identify loneliness. Narrative analysis of interviews with a focus on content, plot, and interpretation cues. EL is identified in first-person accounts and in quantitative studies. 8 male AIDS patients in an outpatient clinic. Three EL plotlines emerge: (1) faith-religion, (2) the face of death, (3) nature-meaning of life. These plotlines are suggested to be helpful for AIDS care. To examine various theoretical approaches that have informed the conceptualisation of and research on loneliness. The focus is on the subjective and phenomenological qualities of loneliness. Examination of the phenomenological, existential and philosophical explorations of loneliness. EL is portrayed with reference to various authors and deepened by comparing its characteristics with the general literature on loneliness. Material gathered in a phenomenological research project directed to elderly residents in nursing homes. The elderly, especially those residing in nursing homes, are vulnerable to feelings of EL. EL is independent of object loss or inadequate relationships and may arise when minds and bodies have no meaningful occupation. To examine the nature and forms of loneliness from a secular and spiritual existentialist view. EL is one form of loneliness. Types of loneliness are distinguished by argumentation. The existential view is complemented with often implicit phenomenological (1995) and neo-Freudian (1992) insights. Being with others is man’s primary mode of being. This makes loneliness metaphysical: an absence perceived as presence. EL refers to man’s lonely nature and the loneliness of experiences. To argue that we must come to grips with our EL if we are to fully embrace our humanity and that love is the only healthy response to our dilemma. Pathological loneliness is reviewed and discussed. Argumentations are mainly supported by existential and neo-Freudian psychodynamics. Proposal for an epistemological monism regarding the issue of life-death and EL-connectedness. This approach implies a consciousness in which we are always living and dying, alone and together. To show that common approaches to the treatment of loneliness are insufficient, and to show how the existential dimension of illness and the loneliness it can produce can be dealt with. EL is described from three distinct frames of reference: philosophy, literature and clinical care. The deficits of the general account of loneliness are pointed out. An existential perspective on loneliness is promoted. A case study of one of his hospitalized patients who suffered and died from cancer of the lymphatic system. In illness, the human response to loneliness—relating to another and creative expression—is threatened. EL is rarely discussed in clinical practice but should be dealt with to realize our deepest human responses towards life. To give an overview of existential psychotherapy. Existential isolation is considered to be an ultimate concern of the human being’s existence in the world. A portrayal of existential (in contrast to Freudian and neo-Freudian) psychotherapy is presented and defended by means of a philosophical-psychological-historical analysis. The stories of several of their own psychotherapy patients as examples. Existential psychotherapy perceives problems not as a composite of drives, archetypes or conditions but as ultimate concerns. Fear of existential isolation underlies a great deal of interpersonal psychopathology. To explore the relevance of the concept of EL to the HIV population with a special focus on HIV-infected women. Analysis of empirical psychological and existential-phenomenological literature. The EL concept is reviewed, methods to measure EL are discussed, and the causes of EL and its implications for psychotherapy are delineated. An existential therapeutic perspective highlights the crucial feelings that HIV-infected women struggle with, including death and EL. Identifying and appropriately treating the EL experience of this group is important. To explicate the existential meaning of severe mental illness and to define the competencies that mental health professionals need when providing nursing care to formerly hospitalized patients. Qualitative non-structured interviews. Interpretations are based upon psycho-analytical theories and Gadamerian-Ricoeurian hermeneutics. Interpretations influenced by existential philosophy shed more light upon severe mental illness. Seven individuals primarily diagnosed with psychosis and who relocated from an institutional setting to a community placement. People with severe mental illness have difficulty changing by sharing experiences with other people. They experience EL because they struggle to change their previous suppositions about human relationships. To present the development and preliminary findings of the EL Questionnaire (ELQ) as well as to examine the discriminative validities of the ELQ. A literature survey is used to generate items. Questionnaires of the UCLA, BDI, Hopelessness, and Purpose-in-Life scale are administered to patients to determine conceptual overlap and discriminative validity of the ELQ. 47 HIV-infected women in a paediatric HIV clinic. Symptomatic HIV-women feel death to be more immanent than asymptomatic HIV-women. Consequently, their adaptive defences may break down and they may be overwhelmed by feelings of EL, producing higher ELQ-scores. To capture the extent to which HIV-infected mothers experience EL. Given the richness of the material, to shift the analysis from EL to a broader range of existential issues. Semi-structured interviews. Analysis is done by a cross-case content analysis. In the analysis, both existential-humanistic-philosophical and psychoanalytic concepts are employed. 9 HIV-infected women recruited from another 2002 quantitative study. 8 of them were receiving public assistance at the time of the interview and were mothers of HIV-infected children. The HIV-infected mothers struggle with a range of existential issues, including loneliness and isolation. The mothers’ involvement with their children helps ameliorate their feelings of isolation and loneliness. To explore in palliative patients with cancer their experience of existential isolation, the origin of these feelings, and how they relate to family members. In-depth interviews are analysed with a qualitative, hermeneutic method based upon existential-psychological literature. 40 respondents—20 patients and 20 family members. All patients defined themselves as non-religious. Patients and family can experience significant EL during the course of a disease. Certain changes and circumstances cause a deterioration of EL. The dying body, i.e., impending death, is the main cause of EL. To offer a phenomenological account in which one experiences existential malaise and existential freedom. An argument built on Kierkegaard, Heidegger, and Sartre. Argues that EL is cured by accepting and understanding one’s existential emptiness, giving up trying to solve it by one’s own powers, and by permitting existential completeness to come. To analyse the lived experiences of aphasia and the struggle to regain the ability to communicate. Aphasia is considered to be a form of EL. In-depth interviews, follow up interviews, diaries and published books by the participants. For analysis, a lifeworld hermeneutic approach inspired by Gadamer and Ricoeur is used. 4 women and 5 men, aged 45–72, selected on the basis of their ability to communicate orally and/or in writing relatively well despite their aphasia. A person with aphasia must cope with EL. EL is described as being shut up in the body without communication and as being no longer together with the same person that one was before. To describe women’s lived experiences of fear in relation to childbirth. EL is part of this experience. Qualitative interviews using a lifeworld perspective for psychodynamic interpretation. A phenomenological analysis reveals an essential structure of the experience of fear in relation to childbirth. 8 pregnant women at 24–37 gestational weeks seeking help at an outpatient clinic for women with severe fear of childbirth. To establish the organising framework for our systematic review, we distinguished loneliness from other similar notions, we explored the relation between EL and loneliness, and we identified the main dimensions of the EL concept. In order to do so, we used three general volumes that represent well accepted perspectives on loneliness [30, 31, 32]. To analyse the EL concept, we compiled a general outline of the concept from an extended reading of the literature. We then tested the general outline for internal coherence by identifying the key notions that together form the framework of the EL concept and by analysing their interrelatedness. Subsequently, we advanced the general outline in three steps: we clarified problematic characterisations of EL, accounted for the distinctive contribution of each key notion of EL, and subdivided each key notion into the dimensions of EL. From there, we critically explored each key notion with regard to clarity and consistency. Finally, we examined the relevance of the EL concept for end-of-life care. Some studies reduce the experience of loneliness to a phenomenon of isolation or solitude. Therefore, the task of distinguishing loneliness from both isolation and solitude should precede adequate analysis of the EL literature. Isolation refers to the factual state of being separated. As such, it is an external and objective condition that can be measured and to some extent controlled. When isolation is perceived and evaluated, it turns into an experience, which is internal and subjective . The experience of isolation can take either the form of solitude or loneliness. Solitude indicates a positive experience of isolation, i.e., a constructive way of being separated from others in order to be by and with oneself. Loneliness, on the other hand, indicates a negative experience of isolation, i.e., a mentally distressing and physically stressful way of feeling and being alone [14, 34, pp. 105–106]. Although the distinction between isolation, solitude, and loneliness is widely accepted, it is not always used nor is it entirely accepted without discussion. For example, in his 1961 study, Moustakas does not distinguish between loneliness and solitude , but does so in his 1972 study . In addition, Yalom connects isolation and loneliness without explication [36, p. 355ff. ], and Sand and Strang seem to use the terms interchangeably [12, pp. 1376–1377]. Furthermore, the distinction between positive and negative aspects of solitude and loneliness may be disputable for cultural [34, p. 106] or semantic [37, p. 21] reasons. Mijuskovic even claims that distinguishing between aloneness, isolation, and solitude is futile since all these terms are reducible to the more primordial form of ‘fear of loneliness’ [27, p. 66; 38, p. 7]. Finally, there is discussion about the relationship between loneliness and the alleged inherent healing force of solitude [39, pp. 64–65; 40, pp. 51–52]. In spite of these discussions, most authors on loneliness subscribe to the distinction between isolation, solitude, and loneliness [e.g., 2, 35, 40, 41]. Therefore, this distinction functions as a point of departure for our analysis. Since EL is a form of loneliness, adequate analysis of the concept requires insight into the relationship between EL and loneliness. A common description of loneliness is the feeling of sadness and longing that results from a lack of relatedness with some aspect of our world [2, 42]. This relatedness is often characterised in terms of emotional, social, and existential connections to the world, which lies at the heart of the general distinction between emotional, social, and existential loneliness [e.g., 37, 43, 44]. With regard to this distinction, some authors prefer to speak of intrapersonal or trait loneliness, interpersonal or state loneliness, and EL [e.g., 12, 16, 36, 45]. In these distinctions, EL is generally considered to be one dimension of loneliness [e.g., 13, p. 684; 45, p. 1185] and is further characterised in at least three different ways. Firstly, EL is characterised as a basic form of loneliness [e.g., 37, p. 21; 44, pp. 32–33]. This basic form is usually specified as a condition of human existence; one is always and fundamentally separated from others [e.g., 11, p. i; 16, p. 542; 46, p. 23; 47, p. 1; 48, p. 70]. One becomes especially aware of this fundamental separation in the case of frightening threats to being [38, p. 3; 49, p. 27]. Secondly, EL is characterised as a specific form of loneliness among other forms [e.g., 45, p. 1184]. This specific form of loneliness is mainly articulated in terms of an experience [e.g., 12, p. 1376; 47, p. 1; 48, p. 70; 50, p. 93], including the experience of a total absence of any relatedness [e.g., 38, p. 17; 41, p. 57; 51, p. 274]. Some authors claim interrelatedness between the different forms of loneliness [e.g., 12, p. 1377; 36, p. 355]. The experience of EL may then refer to an unspecific loneliness component, which is also present in other forms of loneliness, as well as to a specific loneliness component that can be characterized as EL [e.g., 15, pp. 96–97; 45, p. 1190]. Thirdly, EL is characterized as a process in which the negative experience of man’s lonely nature is transformed into a positive one [e.g., 11, p. 24; 35, p. 145; 36, p. 361; 46, p. 26; 47]. Hence, people who face a personal crisis may be confronted with EL and, from that, forge more meaning in their lives [e.g., 50, pp. 5, 8, 14]. This process of inner growth is the result of man’s possibilities as a human being. Since these three characterisations are most prominent in the relationship between EL and loneliness, we consider them as referring to three dimensions of EL: a condition of human nature, an experience of this condition, and a process of inner growth that may result from the experience of this condition. These three dimensions function as a framework for our conceptual analyses of EL. We started our analysis with an extended reading of the literature, from which we compiled the following general description of EL. This general description necessarily lacks some coherence because authors often present descriptions which are limited in scope and may contradict each other. EL is an intrinsic aspect of being human [46, p. 24] and ‘an everpresent feeling of aloneness, against which one defends oneself for much of the time but for which there is no permanent remedy’ [50, pp. 95–96]. Although one may, for example, distract oneself with love relationships, tasks, or vacations, one’s defences may prove inadequate in the face of certain disruptive events such as death or separation. These events confront one with frightening threats to being and induce a basic sense of loneliness that reflects our being ultimately alone in our own reflective consciousness [36, p. 355; 38, p. 27]. Since EL occurs in cases of frightening threats to being, EL and death are claimed to be intertwined [50, pp. 95–96]. The EL that we experience in the awareness of our own finitude cannot be relieved by the presence of others; we remain fundamentally alone in the anticipation of our death [e.g., 45, p. 1185]. Death is claimed to be the one event in which EL is most evident [12, p. 1377; 36, p. 8; 47, pp. 4–5]. As death is a ‘ceasing to be’ [36, p. 43] and EL is the ‘absence of an awareness of any thing or sensation’ [38, p. 17], death and EL are both characterised by nothingness or a lack of being [49, pp. 35–37]. Because EL concerns our very own existence, it is a solipsistic experience [e.g., 38, p. 69] and subject to severe difficulties of communication [e.g., 11, p. 51]. However, because EL reflects our human nature, we all share in being existentially lonely. To the extent that awareness and acceptance of EL may lead to inner growth, EL is considered to be a positive force [e.g., 11, pp. 34–35; 47, pp. 4–5]. It is by giving meaning to our life and death that we use our potentialities and develop our capacities as human beings [37, p. 21; 47, pp. 4–5]. As a consequence, EL may lead to a ‘turning point in one’s life and an impetus to forge a more meaningful and authentic existence’ [50, p. 106]. In addition to the general description of EL, we listed the issues that appear most frequently in the EL literature. As the precise content of each issue differs per study, we labelled each issue with a notion that covers the different descriptions. By doing so, we identified fifteen key notions that form the basis for our further analysis (Table 2). In the next sections, we will test and advance the internal coherence of the general description and key notions of EL. To test the internal coherence of the concept, we analysed the interrelatedness among the various key notions. From this process, three problematic characterizations of EL emerged. I. EL is seen as both everpresent and as remediable. The literature claims that EL is an everpresent feeling for which there is no permanent remedy [50, pp. 95–96]. However, it is also assumed that one defends against this everpresent feeling for much of the time [idem]. Moreover, psychological defence may ameliorate and even overcome the feeling of EL [e.g., 47, 49, 50, 52]. The problem is that it remains unclear how everpresence and remediability can go together. Whereas everpresence means that a feeling is always felt, successful defence against a feeling necessarily eliminates the feeling temporarily. As none of the authors discuss the tension between everpresence and remediability, this problematic characterisation remains unclarified. II. EL is valued both positively and negatively. EL is negatively valued as an experience of terror and devastation [e.g., 12; 38, p. 27]. EL is positively valued as a force that may lead to inner growth [e.g., 11, 47]. This ambiguous evaluation may be understood in two ways. If there is a chronological order in which the devastating feeling precedes the growth inducing force of EL, the evaluation of EL covers two related but different domains. If devastation and growth are two sides of the same coin—i.e., EL is painful but, as such, also a force towards inner growth—valuation of EL should be based upon the extent to which these elements occur in situations where people suffer from EL. However, none of the authors articulate different domains within the EL concept, nor do they discuss the dynamics between devastation and inner growth. The problematic characterisation of positive and negative valuation of EL remains therefore unclarified. III. EL is seen as both solipsistic and communicable. EL is presented as a solipsistic, i.e., radically subjective, experience [e.g., 38, pp. 27, 69]. At the same time, it is presented as an objective and universal experience that can be identified and communicated to a certain extent [e.g., 16, p. 541]. The problem here is that if, on the one hand, EL concerns the separation from everyone, everything, and every meaning, it cannot be identified or communicated [e.g., 11, p. 51]. On the other hand, if this separateness reflects our human nature, we all share the characteristic of being ultimately alone. Then we should be able to communicate, at least to some extent, the experience of EL and to conduct research on it. As a consequence, this problematic characterization confronts us with the difficulty of how EL can be explored. Since none of the authors discuss the tension between radical subjectivism and communication, the problematic characterisation of EL as solipsistic and communicable remains unclarified. To advance the general outline of EL, we conducted three steps. Firstly, we clarified the problematic characterizations of EL by using the three dimensions of EL mentioned in our organising framework: (1) EL as a condition of human nature, (2) EL as an experience of this condition, and (3) EL as a process of inner growth. In the first problematic characterisation, everpresence then appears to refer to man’s unchangeably isolated human condition, whereas remediability turns out to refer to the process of inner growth. In the second problematic characterisation, the positive valuation of EL turns out to refer to the process of inner growth, whereas the negative valuation appears to refer to the actual experience of EL. In the third problematic characterisation, solipsism turns out to refer to the experience of EL that can hardly, or not at all, be communicated, whereas communicability appears to refer to the lonely condition of human nature, which can be communicated because it is shared by all. The use of the three-dimensional framework for understanding the EL concept thus clarifies the problematic characterisations of EL mentioned above. Secondly, we accounted for the distinctive contribution of each key notion to the concept of EL. In order to do so, we explored the meaning of the fifteen key notions in depth. Key notions that appeared to have similar meanings were clustered. As a result, the key notion of ‘no permanent remedy’ was placed under the key notion of ‘defence’; the key notion of ‘frightening’ was placed under the key notion of ‘feeling’; the key notions of ‘threats to being’, ‘finitude’, and ‘nothingness’ were placed under the key notion of ‘death’; and the key notion of ‘solipsism’ was placed under the key notion of ‘difficult communication’. By doing so, we reduced the key notions from fifteen to nine. These nine key notions together form the framework of the EL concept: (1) Everpresent, (2) Feeling, (3) Defence, (4) Death, (5) Awareness, (6) Difficult communication, (7) Inner growth, (8) Giving meaning, and (9) Authenticity. Thirdly, we provided a framework for further analysis of EL by subdividing the nine key notions into the three dimensions of EL (Table 3). Since the dimensions as well as the key notions are interrelated, the link between dimension and key notion is limited in strength. That is to say, none of the key notions belong exclusively to one dimension and none of the dimensions are independent from the other dimensions. However, some key notions correspond more with one dimension than with others. For example, descriptions of the ‘feeling’ of EL refer more to EL as an experience than to EL as a human condition or a process. Likewise, descriptions regarding ‘death’ refer more to EL as a condition than to EL as an experience or a process. By thus subdividing the key notions into the dimensions of EL, we provide a practical framework for an integrated and manageable examination of the EL concept. In the following sections, we use this framework to further analyse the concept of EL. From out of a careful examination of the literature, we describe the three dimensions of EL, report the different ways in which each key notion of EL is used, and critically explore each key notion with regard to clarity and consistency. This dimension of EL reflects man’s fundamental aloneness as a human being. Existing in a body that is separated from everyone else, we are encapsulated in our minds—we are unique and, thus, basically solitary beings. EL as a condition of human nature is fundamental to the other two dimensions of EL because it makes the experience of EL and inner growth possible. Most of the literature presents EL as everpresent. The meaning of this everpresence can be understood by using the distinction between isolation and loneliness mentioned in our organising framework. As the EL literature does not always distinguish between isolation and loneliness, both notions are part of the EL concept [e.g., 11, pp. 24, 34–35; 36, pp. 221, 355; 38, p. 3; 50, pp. 95–96]. Applying this distinction to the EL concept shows that the everpresence of EL actually refers to existential isolation, which is the fundamental separation between an individual and his world [e.g., 36, p. 355]. This isolation is mainly presented as a condition, or basic structure, of human nature—it is everpresent [e.g., 11, p. x; 16, p. 542; 38, p. 3; 47, p. 1; 48, p. 70; 53, p. 173]. Because the claim of everpresence is based on human nature, most authors make reference to an anthropological perspective on EL. These perspectives occur in different combinations and vary from experiential [e.g., 48] to phenomenology [e.g., 38, p. 68] and from psychodynamics [e.g., 52] to existentialism [e.g., 41, 47, 50]. In addition, behaviourism may be a relevant anthropological perspective because some studies claim that EL may be physically experienced [12, 41, 54] and recognised by others [11, 12, 47]. The explanatory force of the anthropological perspectives presented is limited. Firstly, most authors offer limited or no exploration of their anthropological perspective. Secondly, some authors refer to the same anthropological perspective as other authors while making different claims concerning man’s lonely nature. For example, taking his point of departure in an existential perspective, Carter presupposes a relation between EL and the spiritual dimension of human nature [47, p. 3], whereas Yalom, who also departs from an existential perspective, rejects such a relationship [36, p. 381]. Thirdly, most authors only partially motivate their choice for one anthropological perspective above another. For example, Yalom  and Carter  motivate their choice for an existential perspective against the background of psychodynamics, Mijuskovic argues for a phenomenological perspective and against behaviourism , and Applebaum accepts a psychodynamic perspective without much further discussion . Consequently, it remains largely unclear how different perspectives on human nature determine the meaning of EL as an everpresent phenomenon in life. The literature presents EL as being intertwined with death. This intertwining is mainly understood as the lonely confrontation with one’s own finite human nature. Various authors suggest end-of-life-situations to be the events in which EL is most evident [e.g., 11, pp. ix, 8; 12, p. 1377; 43]. This does not mean, however, that EL is restricted to end-of-life situations. Numerous events may lead to a confrontation with one’s finitude. For example, EL is claimed to occur in patients with cancer , HIV-infected women [16, 50], patients with severe mental illness [55, p. 131], mothers of chronically ill children , women giving childbirth , and people making various kinds of fundamental decisions [36, p. 319]. Hence, all kinds of threatening events may lead to an awareness of one’s lonely being. Therefore, the intertwined relationship to death is to be understood as a confrontation with all ‘threats to being’ in which who one is may come to an end. The intertwined relationship between EL and death is described in various but often limited ways. Some authors just claim that the separation brought about by the approach of death leads to EL [2, pp. 140–141; 36, p. 356]; others tend to identify EL with the confrontation with one’s own death [12, 47]; and still others restrict themselves to showing some similarities between EL and death [38, 41]. Furthermore, none of the authors answer the question of what it means to stand in a relationship to death. One reason given for this is that relatedness implies relatedness to something. Since death necessarily excludes all relatedness, it is unclear how relatedness and death can be compatible [13, p. 693; 36, pp. 221, 365ff.]. Finally, the literature does not differentiate for the type of death-related crisis. Thus, the EL of standing fundamentally alone when having a life-threatening illness does not differ from the EL of standing alone in old age or when dealing with the loss of a child. Due to the limited exploration of the meaning of death, human finitude, and nothingness, the relationship between EL and death remains largely unclear. The literature claims that people may defend themselves against their existential lonely condition. By loving, intellectualizing, living a busy life, expressing oneself creatively, and constantly raising one’s level of achievements, the awareness of being fundamentally alone may be avoided. As a consequence, the transition from EL as an everpresent condition to the experience of this condition can be overcome or escaped from [e.g., 11, pp. ix, 31–35, 47; 16, p. 542; 36, p. 362; 38, p. 35; 49, p. 35]. Some activities are claimed to be especially effective for defence against one’s lonely condition, such as actualising one’s potential, having children [50, p. 105], and engaging in friendships [38, p. 100]. However, there is no permanent remedy for our existential lonely condition [e.g., 11, p. 35; 50, pp. 95–99]. Since nearly everyone is confronted with overwhelming crisis situations in life, frightening threats may wedge open one’s defences and break through [e.g., 11, pp. 31–32]. As such, the collapse of defence seems to be a self-organising process that results from the forces that are operative between man’s lonely nature and life threatening events over which the individual has no ultimate control. A closer look at the collapse of defence shows that the role of the individual is ambiguous. On the one hand, it is claimed that the individual has no active role in the breakdown of defence. As long as defence is possible, the individual will not give up, for giving up means experiencing a horrible suffering with an unknown outcome. But at a certain point it seems that people simply fail to resist any longer due to their crisis situation. Indeed, the literature does not present any examples of people who choose to be confronted with their EL. On the other hand, it is claimed that the individual takes part in the breakdown of their defences by actively stopping to escape from his existential lonely condition. The literature speaks in terms of ‘acceptance’, ‘surrender’, and even of ‘a courageous facing it’ [e.g., 11, pp. x, 48, 102]. In this latter interpretation, stopping to escape from one’s EL is a decision or an act of will. These two characterisations of the role of the individual—a passive failing to escape or an active facing of one’s EL—show that it is not clear to what extent defence against EL is open to the conscious agency of the individual. This dimension concerns the experience of one’s lonely human condition. When defence fails due to a life-threatening event, people may experience the lonely emptiness and nothingness that is inherent in the confrontation with their finitude. The dimension of EL as an experience relates to the other two dimensions in that it reflects the emotional impact of man’s lonely human nature and functions as a condition through which inner growth is possible. The feeling of EL is described as a total lack of relatedness. Although some authors on EL explicitly stress that EL is not a lack of something but just what one is [e.g., 38, 47, p. 5], their actual descriptions of EL are also formulated in terms of absence. For example, EL is described as a feeling of ‘emptiness’, ‘timelessness’ [11, pp. ix, 40, 43], and ‘nothingness’, and therefore, as having a ‘toneless quality’ [38, pp. 17–18]. As this absence is ‘total’, the feeling of EL is the absence of everything and leaves no room for other perceptions or feelings [11, pp. x, 40; 38, p. 20]. The feeling of EL has both a positive and a negative connotation. Positively, it is characterised as a growth inducing force—an affirmative experience of one’s lonely human nature by which one arrives at unique and thrilling sensations of being an individual [11, p. x]. Negatively, it is considered to be a tremendously frightening and devastating experience. This extremely negative valuation of the experience of ‘absence’, ‘emptiness’, and ‘nothingness’ dominates most of the literature regarding EL as a feeling [e.g., 12, 47]. Although authors purport to explore the feeling of EL, most get stuck in a variety of superlative terms: terrifying, intolerable, despairing, dreadful, terrible, and horrifying [e.g., 2, p. 8; 11, p. x; 38, pp. 3, 14, 27]. The reason why EL is so extremely frightening remains largely unexplored. Are we frightened by the realisation that we will cease to be [36, p. 43], that our consciousness will continue alone in an empty universe [27, p. 74], or that we will lose our connectedness with our surrounding reality? The EL Questionnaire (ELQ) reflects some of the difficulties in describing the EL experience. Relevant issues that occur in the context of HIV-infection, such as ‘facing death and a foreshortened life’ and ‘the terror of non-being’, are transposed into response items, such as ‘there is a purpose to my life’ and ‘the universe is full of meaning’. Item analyses led to 22 items that are internally consistent and that together form the ELQ. The ELQ is said to perform well in measuring an underlying construct that can be conceptualised as EL . However, as the items are taken from situations that may generate EL [45, p. 1185], the ELQ measures how people respond to these situations rather than whether people feel existentially lonely. Due to the difficulties in exploring the intangible feeling of EL, it remains unclear what the feeling of EL is like. The literature shows that the EL experience has an emotional and a cognitive component that is related to the awareness of one’s own finitude. Some authors stress that EL is a feeling that is generated by the inability to find meaning in situations where death has to be faced directly and over a prolonged period of time [e.g., 12, p. 1377; 16, p. 549; 45, p. 1185]. Others stress that EL is a cognition which results from a shift away from the everyday attitude towards an ontological attitude—a mode of being in which one is mindful of being human, i.e., a being that includes the inevitability of death [e.g., 36, p. 319; 53, p. 173]. Generally, the emotional element of EL turns out to be irreducibly non-conceptual. That is to say, the feeling of absence appears as an immediately felt quality that cannot be conceptually expressed. It can only be understood cognitively in positive terms as the overwhelming desire of the unrelated ego to locate, unify, connect, or bind itself to other egos or objects [38, p. 15; 58]. The ungraspable meaning of ‘absence’ is then put aside and replaced by a more easy to understand ‘desire’ or ‘force’. Hence, both the emotional and rational awareness of one’s own finitude remain unexplored. The centrality of awareness of one’s own finitude raises the question of how we should understand the structure of the EL experience. After all, it remains unclear how the absence of relatedness may lead to an experience at all. Only few authors dare to claim that they have solved this riddle. They mainly do so by means of a phenomenological theory of consciousness [36, 38, 41, 51, p. 285]. One of the fundamental ideas of transcendental phenomenology is that consciousness exists by virtue of the fact that a subject is directed towards an object. Without this relationship consciousness is nothing. In the case of EL, consciousness can no longer be directed to an object other than itself. The experience of EL thus manifests itself as the confrontation of consciousness with its own nothingness—a confrontation in which the awareness and the feeling of nothingness coincide. It is this coincidence that blocks any further articulation of the awareness of a nothingness that results from the absence of relatedness. As a consequence, it seems that this awareness cannot be further conceptualised. Two aspects of communication may be distinguished in the literature: the expression of the EL experience and the understanding of this expression by others. People have extreme difficulty articulating their EL experience [11, p. 51; 38, p. 15]. The literature presents three reasons for this difficulty. Firstly, in the intertwined relationship between EL and death, death is claimed to be inaccessible because it lies by definition outside of experience [e.g., 41, p. 57]. Secondly, as consciousness is thus claimed to be directed at nothingness, the EL experience can only be understood in terms of non-being [38, p. 27]. Thirdly, expression is limited by the referential structure of language. That is to say, it is claimed that man is conscious of his lonely nature before he learns to express this fact in language [54, p. 43]. Once EL is expressed in language, the expression is necessarily a faint reflection of the reality intended [38, pp. 3, 81–85]. Due to these reasons, the EL experience is subjected to severe difficulties of expression. Since EL is difficult to express, onlookers can scarcely understand the EL experience of others. Various authors, however, claim that the EL experience may be recognised and shared through a felt understanding of one’s own solitary nature [e.g., 11, pp. 39, 51; 52, p. 20]. From such a self-understanding, it is suggested, the experience can be conceptually imparted [e.g., 38, pp. 15, 85]. However, it remains unclear how this impartation is to be understood because, in general, concepts can be imparted without the need for experiencing the related feelings. Some authors suggest that the experience can also be bodily imparted [e.g., 11, pp. x–xi; 12, pp. 1383–1385]. Such bodily expressions are explicated in terms of ‘a face filled with indescribable loneliness and defeat’ and the bodily recognition of ‘a new wave of loneliness’ that comes over one [11, pp. 18, 20]. Furthermore, some authors suggest a relationship between bodily integrity and the perception of EL [e.g., 12, 41, p. 45]. In that case, behavioural correlates may be an entry for a better understanding of EL. However, as bodily recognition goes beyond conceptual understanding, it remains unclear how the experience of EL may be further accessed for conceptualisation. This dimension concerns the transforming aspects of EL. The confrontation with one’s own lonely human nature may lead to inner growth. As such, inner growth follows upon the EL experience. This dimension relates to the other two dimensions as it shows the potential of man’s lonely nature and it indicates how the EL experience may transform one through a renewed relatedness with oneself, others, and the universe. Most authors claim that the negative experience of EL may be transformed into a positive one. There are roughly three different characterisations of EL as a process of inner growth. Firstly, inner growth is presented as a personal growth in which one’s own potential can be actualised [e.g., 49; 50, p. 101]. Secondly, inner growth is described as an interpersonal growth in which one develops deepened relationships with heightened feelings of intimacy [e.g., 36, p. 355; 51, p. 285; 59, p. 94]. Thirdly, inner growth is described as a spiritual growth in which one relates oneself to a transcendent reality [e.g., 47, 48, 60, 61]. Various authors claim that inner growth covers all three characterisations [e.g., 11, 59]. The meaning and interrelatedness of the different characterisations are understood differently. For example, Moustakas presents spirituality as an independent and relevant area of inner growth [11, pp. 48, 50, 56], Mayers et al. interpret spiritual growth in terms of coping and thus as personal growth , and Yalom interprets spirituality as an unacceptable escape from self-awareness and thus as personal decline, not growth [36, pp. 380–381]. Since EL is triggered by frightening threats to being, the awareness of one’s own mortality is presented as the most important ground for inner growth [e.g., 36, pp. 30ff. ; 50, p. 95]. Consequently, the meaning of inner growth also depends on the meaning that one gives to death. Immanent meanings of death—for example, death as a life structuring force—will mainly be applied to the area of personal and interpersonal growth. Transcendent meanings of death—for example, death as a passage to an afterlife—will mainly be applied to the area of spiritual growth. Whether immanent and transcendent meanings of death lead to inner growth at the end of life depends largely on how powerful these meanings are and on the individual’s willingness to rely on such meanings. The literature offers limited insight into the different meanings of death and hardly discusses the definition of and requirements for inner growth—whether it be personal, inter-personal, or spiritual growth. It therefore remains to a large extent unclear what inner growth is and how it may be achieved. The literature claims that one can only live authentically by truly experiencing one’s EL [e.g., 47, p. 5; 49, p. 36]. The meaning of authenticity includes both the acceptance of one’s lonely nature and the process of self-actualisation through which one finds oneself. Thus, by discovering and recognising one’s own pre-given lonely nature, consciousness experiences its own nothingness. This experience provides the resources for growth in awareness, perceptiveness, and sensitivity. From there, one may achieve the self-actualisation of knowing who one is, what one’s relation to others should be, and what the meaning of one’s life is [11, pp. 34–35]. The EL literature mentions three aspects of this authentic self-actualisation, which are usually not clearly distinguished. Firstly, authentic self-actualisation is an individual self-creation that results from making one’s own choices [e.g., 16, p. 548]. Secondly, authentic self-actualisation is a social construct that results from intimate shared values with others [e.g., 50, pp. 105–106]. Thirdly, authentic self-actualisation is a revealing process that results as a gift from the self-organising process of the EL experience [e.g., 11, p. 102; 41, p. 56ff.]. The different aspects of authentic self-actualisation show various ways of attaining inner growth. Each way, however, is characterised by its own difficulties concerning authenticity. With regard to creating one’s own self-actualisation by making choices, there are no objective criteria by which authenticity can be measured. That is to say, one wants to be loyal to oneself, but by rejecting any pre-given meaning of this self, one lacks the criteria upon which authenticity can be affirmed or rejected. With regard to socially constructing one’s own self-actualisation from intimate shared values, there are no criteria by which one can distinguish between dependency and independence. That is to say, it necessarily remains unclear whether one’s self-actualisation is derived from oneself or from others. With regard to discovering one’s own self-actualisation, there are no guidelines for recognising the discovery as authentic. That is to say, it remains unclear if the gift from the self-organising process of EL represents one’s authenticity or something else. The literature does not discuss the difficulties of auto-confirming one’s authenticity. Therefore, it remains unclear when inner growth is authentic or not. The literature shows that inner growth may be achieved by giving spiritual or non-spiritual meaning. One can give spiritual meaning by, for example, reinterpreting one’s crisis situation by assigning a transcendent meaning to it, reframing one’s situation by changing beliefs about reality, and developing a heightened sense of spirituality [e.g., 43, 50, pp. 104–106)]. One can give non-spiritual meaning by, for example, making a comparison with others in worse situations, universalising one’s situation, teaching and sharing experiences with others, and finding reasons to be hopeful [e.g., 50, pp. 104–106]. It seems to be of little importance whether the given meaning is valued as corresponding to one’s true human nature [e.g., 62, p. 344–345] or as a psychological coping strategy [e.g., 50, p. 106]. It is not the truth of the given meaning that is important but the patient’s subjective experience that results from the belief in a more or less objective consistency across situations [16, p. 548; 53, p. 173]. Consequently, the possibility of inner growth is closely connected to one’s spiritual or non-spiritual perspective on reality and the way in which giving meaning relates to such a perspective. Depending on the perspective on inner growth, the act of giving meaning is presented in different ways. In cases where inner growth results from choosing who one wants to be, giving meaning is mainly described in terms of creation [e.g., 38, p. 96]. In cases where inner growth results from intimate shared values with others, giving meaning is mainly described as a construction [e.g., 50, pp. 105–106]. In cases where inner growth results from discovery, giving meaning is mainly described as finding meaning [e.g., 11, p. 102]. Moreover, some authors suggest that inner growth does not primarily result from giving meaning within one’s perspective on reality, but rather, from a shift of reality perspective. For example, people may shift their perspective on reality by altering their dualistic thinking in terms of life-death and aloneness-connectedness to a monistic thinking in which they are at the same time living and dying, alone and connected [e.g., 46, p. 30]. However, it is also suggested that giving ultimate meaning is impossible [49, p. 72]. Since neither these differences in giving meaning nor their specific requirements for realisation are elaborated on, it remains unclear how and to what extent people may give meaning to situations that they experience as meaningless. The analysis of the dimensions and key notions of EL shows significant differences in the conceptual outline of EL (Table 4). To visualise these differences, we listed the authors on EL together with the different dimensions and key notions. Subsequently, we considered which key notions were included, excluded, or absent in the different conceptualisations of EL. To understand the cause of these differences, we looked for the anthropological, epistemological, and ethical perspectives in each study. Most of these perspectives remained implicit in the literature, but could be explicated through induction. Although the different anthropological, epistemological, and ethical perspectives ran through the whole EL concept, they appeared mainly in relation to one of the three dimensions. The anthropological perspectives appear mainly in relation to EL as a condition of human nature. The main line of distinction is between Freudian and neo-Freudian versus existential and existential phenomenological perspectives. From Freudian or neo-Freudian perspectives, EL necessarily results from conflicting drives or the individuation process [e.g., 52, 55, 62, p. 334]. It lasts for relatively short periods of time and leads to emotional growth. From existential or existential phenomenological perspectives, EL is a consciousness related condition of human nature [e.g., 36, 38, 45, 47]. It is everpresent and may lead to emotional [e.g., 11, 36], social [e.g., 35, 47], or spiritual [e.g., 48, 62] growth, or to no growth at all [e.g., 38]. Since these differences induce a lack of conceptual clarity, systematic elaboration of the anthropological presuppositions in the EL literature may further clarify the EL concept. The epistemological perspectives appear mainly in relation to EL as an experience. Here, the main line of distinction is between phenomenological and hermeneutical perspectives. From a phenomenological perspective, the EL experience can be accessed and objectified by taking numerous narratives and then eliminating their subjective contexts [e.g., 11]. Subsequently, essential aspects of the experience may be transposed into a questionnaire to explore whether, and if so, to what extent someone feels existentially lonely [e.g., 16, 45]. From a hermeneutic perspective, understanding of the EL experience will always be related to context. This understanding is necessarily intersubjective because the person’s as well as the researcher’s pre-understandings determine the meaning of the EL experience [e.g., 47]. Since these different epistemological perspectives influence the conceptualisation of EL, systematic elaboration of the epistemological presuppositions in the EL literature may further illuminate the EL concept. The ethical perspectives mainly appear in relation to EL as a process of inner growth. Here, the main line of distinction is between defence against EL, thereby avoiding both suffering and inner growth [e.g., 38, 50], and acceptance or embrace of EL, thereby accepting suffering and the possibility for inner growth [e.g., 47, 48]. As far as the aim is defence, the main suggestions for intervention are distraction , engagement in friendship , and sensitive bodily contact . As far as the aim is inner growth, the main suggestions for intervention are existential psychotherapy , interpersonal support , and pastoral care . Since these differences give rise to conceptual differentiation, systematic elaboration of the ethical presuppositions in the EL literature may further elucidate the EL concept. This review reveals a lack of agreement and a profound lack of conceptual clarity regarding the meaning of EL. Distinguishing between the three dimensions of EL—as a human condition, as an experience of this condition, and as a process of inner growth that may result from this experience—leads to some conceptual clarification. It clarifies the problematic characterisations of everpresence and remediability, of positive and negative valuation, and of solipsism and communicability. It may be objected that the use of a three-dimensional structure complicates rather than facilitates the analysis of EL. Analysis might be more easily conducted by focusing on EL as an experience. After all, loneliness, and thus EL, refers primarily to the experience of isolation and not to a human condition or a process of inner growth. However, stripping the latter two dimensions from the concept of EL would be unsatisfying because the three dimensions are profoundly interrelated. It is man’s lonely condition that appears in the experience of EL, this experience may result in a process of inner growth, which in turn reflects man’s lonely condition as a potentiality for being human. Because of this interrelatedness, all three dimensions are essential for an adequate understanding of the EL concept. The identification of the nine key notions and their subdivision into the three dimensions provides a practical framework for a more detailed clarification of the EL concept. As such, the three-dimensional structure with key notions may serve in the further development of care strategies. Here, it may be objected that none of the key notions is specific enough to function as an unambiguous basis for such developments. To arrive at care strategies, the EL concept should be first differentiated along the various anthropological, epistemological, and ethical perspectives that underpin the concept. Subsequently, the differentiated concept of EL should be adjusted to the personal characteristics of the patient. Since this requires a great deal of theoretical, empirical, and clinical insight, we are far from an adequate care strategy for those suffering from EL at the end of life. Although this objection is justified, it does not render the EL concept useless for end-of-life care. On the contrary, it shows the need for adequate care strategies for EL at the end of life, and reveals that caregivers lack a well-considered set of criteria for dealing with this disruptive experience. The key notions may therefore function as a starting point for the development of these criteria. The relevance of clear criteria for dealing with EL may be illustrated by the example of some actual debates concerning the care for EL at the end of life. This care is mostly discussed in relation to euthanasia, continuous deep sedation (CDS), and psycho-social or spiritual care, especially in northern Europe. 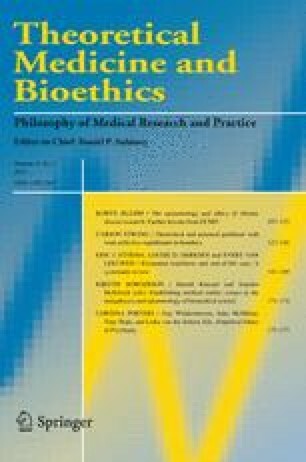 Various authors argue that EL at the end of life should be accepted as a justified motive for a patient’s request for euthanasia or physician assisted suicide [63, 64]. Less extreme, but still remarkable, is the not uncommon practice in Dutch end-of-life care of applying CDS in cases of existential suffering . This is remarkable considering that psycho-spiritual support, not sedation, forms the basis for the Dutch end-of-life guideline on existential crisis . In keeping with this guideline, some authors argue for spiritual support in cases of EL in dying in order to help the patient give meaning to his or her own finitude . However, actual practice shows that psychologists or pastors are only involved in the treatment of a minority of patients and, slightly more often, shortly before death [3, p. 164]. The lack of clarity about what to do at which stage and in which case shows the need for further elaboration of the EL concept for end-of-life care. The limited attention to the patient’s possibility for inner growth suggests that the dimension of inner growth may especially contribute to the development of an end-of-life care that focuses on the relief of pain—whether bodily, emotional, social, or spiritual. The implication for end-of-life care in relation to EL is that care strategies would not just alleviate the EL that may result from having to die alone. Instead, it would stress the relevance of authentic personal, interpersonal, and spiritual growth in and from suffering from EL. This would require caregivers to have a special eye for the patient’s singularity and characteristic way of suffering as well as for his potential for inner growth. On the one hand, EL at the end of life may be a devastating experience that requires relief. But on the other hand, by seeing it as a condition of human nature, it may also be a space in which patients become most aware of their deepest human responses to being an individual . Consequently, end-of-life caregivers are faced with ambivalent values in addressing the EL of dying; one may passively respect the silent suffering of EL or actively deal with it. Due to the present-day focus on the patient’s individual autonomy and informed consent, the former option is most likely to be adopted by caregivers. This may increase the patient’s suffering from EL because it leaves the patient with a fundamental aloneness in giving meaning to his own life in the process of dying. The challenge is to guide the patient through this aloneness and to create conditions for a positive transformation by reminding him that his individual being has meaning in spite of his dying. In order to develop guidelines for dealing with EL at the end of life, the relevant anthropological, epistemological, and ethical aspects of EL need further exploration. In addition, the meaning of EL needs exploration from out of its intertwined relationship with death. In order to do so, both theoretical and empirical research is required. Theoretical research can clarify the isolative impact of death in terms of its nullification of relatedness; it can demarcate the limitations of interviewing respondents about their EL experiences; and it can illuminate different objectives that may be aimed for in end-of-life care. Empirical research can also illuminate the different care practices regarding EL at the end of life; it can test for the clarity, consistency, and relevance of the notions used, and it can investigate the causes of EL. This combination of theoretical and empirical research may lead to a more adequate framework for understanding EL in relation to end-of-life situations. From there, better end-of-life care can be developed for people with a life-threatening illness. Carter, Michele A. 2000. Abiding loneliness: An existential perspective on loneliness. Second Opinion 3. http://www.parkridgecenter.org/Page437.html. (Accessed June 5, 2008) [page reference based on 12 screens].